Following the post on Site Health mechanisms released in WordPress 5.1, the feature labelled “Fatal Error Protection” (see #44458) was reverted, resulting in it not ending up as part of that release. A bad request could be made to the WordPress site targeting a specific plugin, for example with a request method or parameters that said plugin does not expect. Following that, the plugin might throw an exception, causing the plugin to be paused – i.e. an attacker could intentionally use such requests to force pausing of a plugin. This was arguably the most severe concern, since, while plugins should absolutely validate parameters rather than causing a fatal error, many have weaknesses in this area. A flaw in one plugin could cause another plugin to be paused, rather than the flawed plugin itself. A good example of this is exceeding the memory limit: plugin 1 runs a way too expensive procedure, but then the memory limit is reached by a random plugin 2, causing the latter to be the origin of the fatal error. A plugin failure in the frontend could affect that plugin to be paused in the backend, although it might not have caused a fatal error there. The frontend is a “non-protected endpoint”, for which plugins or themes should never be paused. Multiple follow-up tickets were created to mitigate these issues, but eventually the team came to the conclusion that all these tweaks would have only slightly reduced the attack vector, rather than eliminating it. A completely new approach was required, which would require additional time to be planned and implemented. This post outlines the new proposed approach in detail. Please share it and request feedback, both from community members and people less active in the WordPress ecosystem – particularly security experts and hosting engineers. We would like to ensure that the approach is solid to proceed with before it is fully implemented. It should be possible for an administrator to access their admin backend, even in case of a fatal error. While this does not reduce the risk factor of a PHP or extension update, it encourages users to perform an update despite the risks, as they will still be able to at least temporarily fix the problem. If an update breaks their site, it will currently cause a so-called “white screen of death”. With the fatal error protection, it should display a specific screen informing the user about that there is a technical problem with the site. The administrator should then be able to access their backend. There they can look at the extensions that are broken and either deactivate them to fix the problem, or find out about the error and forward it to a developer of their choice. Even in the latter case, the administrator might see enough value in deactivating the broken extensions to at least temporarily ensure the site’s frontend is accessible again. A secondary goal of the feature is to inform the site owner about fatal errors that have occurred for visitors of their site, without the owner being involved. This ensures that in case an administrator forgets to check their site after an update or if an error has happened in a rather specific area, they still find out when their site is inaccessible. Explicitly not a goal of the fatal error protection is error logging. While it should be possible for an administrator to see the latest error which an extension has caused and which has resulted in that extension’s pausing, not more errors than necessary as that should be stored in the database. Error-logging is a different feature focused more towards developer audiences, and an implementation using the WordPress database could easily clutter that and decrease performance of a site, thus introduce negative side effects for minor benefits. It should also be noted that the fatal error protection is not related to recovering a hacked site. As the feature is targeted towards rather non-technical administrators that do not have capabilities to access or modify their site’s codebase, it should be opt-out via code mechanisms such as constants or filters, so that more advanced developers can disable the feature if they prefer. The feature is targeted for WordPress 5.2 and will be in support of bumping the minimum required PHP version of WordPress to 5.6, which will happen as part of that release as well. What we recognized is that the idea of pausing extensions (plugins and themes) globally is the problem. If an attacker can force-pause extensions, essentially causing them to be deactivated on protected endpoints such as the admin backend or the login page, it can have severe impact for example on security. A security plugin might have a random weakness that, while being an indicator of a lack in quality, is not necessarily security-relevant. However, if that plugin also added two-factor-authentication to the WordPress login page, using the security-irrelevant flaw to pause the plugin would allow the attacker to bypass two-factor-authentication on the site. The idea of pausing extensions makes sense, as it is impossible to act more granularly on a fatal error due to the lack of sandboxing in WordPress. However, it needs to be ensured that pausing happens only for certain users that have sufficient capabilities to fix the issues, either by permanently deactivating the flawed extension or contacting a developer to take care of it – typically the site owner, which in the case of WordPress is arguably an administrator user. The new approach relies on the concept of a recovery mode. Only specific users should be able to enter recovery mode, and only in recovery mode extensions should be eligible for being paused. This ensures that a fatal error does not have global impact. If an attacker intentionally triggered a fatal error in a plugin, they would not get any more from that than they would at the moment. There are two different scenarios for when a fatal error happens. A user is browsing the site (logged-in or not). A fatal error occurs, causing the user to see a screen saying that the site is experiencing technical difficulties. At the same time, a notification email is sent to the admin email address, informing about the fatal error, including the error details and a link with a secret nonce to enter recovery mode. This process is rate-limited, so a maximum of 1 notification email will be sent per hour (filterable). If the user does not have access to the admin email address, the process stops here – they should not be able to enter recovery mode then. The user accesses their emails and clicks on the included recovery mode link. The WordPress site verifies that the nonce in the link is correct, sets a cookie containing another secret key on the user’s machine, and redirects them to the login page. At this stage, the user (or more specifically the client) has effectively entered recovery mode. On every subsequent request, the cookie will be verified by checking the secret key. The user can now regularly login. If a fatal error occurs on the site, the extension causing it will be paused for the user, followed by a redirect to the same URL, until no longer a fatal error occurs. The user can now reliably browse the admin backend. In the dashboard, they will see a notice informing about which extensions are currently paused for them. On the Plugins / Themes screen, they can either resume these extensions (if they think the problem has been fixed) or completely deactivate them (with that action affecting the site globally, as usual). If the user wants to exit recovery mode, there is a link in the admin bar that lets them do so. Once the user clicks that, the cookie will be deleted and extensions will no longer be paused for them. No user is browsing the site. A fatal error occurs (for example in a Cron request), causing the same screen to be internally rendered (even though technically nobody will see it). At the same time, the notification email mentioned above is sent (if not over the rate limit), to inform the person associated with the admin email (typically referred to as the “site owner”) for the website about the error. The feature should only support pausing of extensions that are user-controllable, as in that access is not necessary to set them up. It therefore excludes support for drop-ins and must-use plugins. At least in the first iteration of the feature, it should also not support multisite and the pausing of network plugins. While these plugins can technically be altered without access to the codebase, setting up multisite requires access to the codebase and is an advanced and, relatively seen, rare use-case. Adding support for multisite and network plugins would require much additional exploration and work regarding UI (e.g. should only network administrators or also site administrators be able to access the backend and resume those plugins?). Furthermore there are technical quirks that would need to be figured out in addition (cookie constants, which are needed for the new approach, are only available after network plugins have been loaded). While the feature could generally be supported in multisite even without supporting network plugins, it was decided to explicitly disable the fatal error handler and recovery mechanism for multisite in the first iteration, to explore a solid approach in the future. It is impossible to pause WordPress core, which should not be an issue as core defines which PHP versions it supports and should be compatible with all of them. Even more than today though, it is important to ensure that full compatibility with the latest PHP versions is maintained. The feature cannot function properly if a connection to the database or object cache (if used) cannot be established. The implementation will account for these cases so that it does not trigger PHP notices or exceptions, but it is impossible to work around these limitations further. 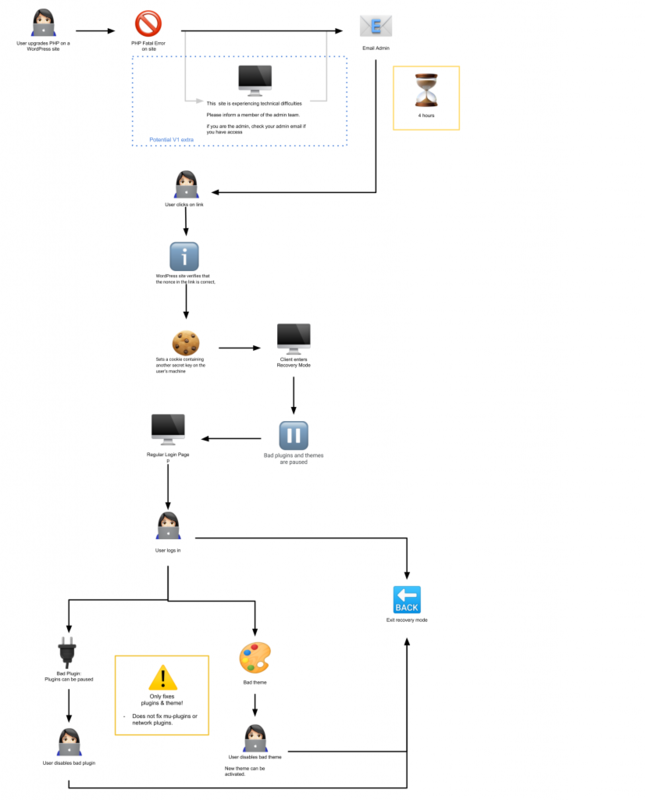 Verifying a request made from a recovery link, setting the recovery mode cookie and redirecting the user. Verifying the recovery mode cookie and based on that enabling recovery mode for the current request. Improving the flow of how an administrator can receive a recovery link, since, in several cases, the admin email address does not cover such users correctly. The fatal error screen could show a link to a new screen that looks similar to the password recovery screen. Here a user could enter their email address, and if they had sufficient permissions on the site, a recovery link would be sent to their email address. In other words, in addition to the link going out to the admin email address, administrators could request their own recovery link manually. Adding support for multisite and network-active plugins. Due to both technical and UI complications and the rather small and usually more advanced amount of multisites, it was decided to omit this for the first version. Since network plugins are however still user-managed (contrary to drop-ins and must-use plugins), it would make sense to eventually support them as well. This would also require thinking about a solid flow to network-resume plugins and handle network-wide recovery mode and related user capabilities. Supporting further customization. While the first version allows overriding the feature, in the future more granular adjustments might become possible. Most likely, this will happen naturally through developer requests that can then be evaluated. We would like to get feedback on the proposal, to make sure to get the implementation right this time. In particular, security and UX require thorough reviews. Please share your thoughts, and also spread the word about this post with others you think would be interested. You can also track the implementation via #46130 and the accompanying pull-request. You can give feedback by commenting on this post or in the #core-php channel on Slack. We also have weekly meetings on Monday, 16:00 UTC. Props @afragen, @miss_jwo, @nerrad, @spacedmonkey, @timothyblynjacobs for review. Just a pie in the sky idea to kill two birds with one stone. Maybe there should be like a “kernel” level admin area and a “user” level admin area. All that normally happens today happens in the “user” level admin area, but the “kernel” level gives you access to manage all plugins and any other system configuration type stuff without executing any of the plugins. 👍! Ya it sounds a bit like having a “safe mode”, which is totally smart. 1) Provide a plugin with the ability to declare itself as never recoverable. Imagine a security sensitive plugin that adds a layer of validation around an admin account (or SSO, or something like that). It is conceivable that disabling such a plugin (even in a recovery mode) could open significant security vulnerabilities. 2) For the cookie generation, Generate a random token with at least 128 bits of entropy (using wp_generate_password(, false) that would be at least 22 characters). The suggestion in Trac to hash it in the database and return the raw one in the cookie is very good. HMACing with a time and a global secret provides both good forward security and the ability to kill all tokens. Nicely done. 3) Provide the ability for administrators to disable recovery mode in any case. This can (and should) default to enabled, but providing the ability to avoid this sort of system can be useful in more strictly controlled environments. 4) Recovery mode should still require authentication to succeed prior to enabling recovery mode. Otherwise, an attacker who gains access to an admin email account (or otherwise intercepts a message) could bypass any other access controls that are in place (such as 2FA or IP limiting) and gain full admin access to the site. This, coupled with (1) should enable reduced attack surface. It is conceivable that disabling such a plugin (even in a recovery mode) could open significant security vulnerabilities. Sadly the reverse of your idea would also be true. Imagine a malicious plugin that does that and prevents you from cleaning up problems easily? Which is a higher risk? Temporarily disabling a security plugin or not being able to disable a malicious one? I would argue that if the plugin is malicious, they have way worse access by that point, and could prevent this “recovery mode” by itself just in the context that they most likely have filesystem access (and hence could patch core to disable recovery). They may not have access, though. I may have misunderstood your idea. It sounded like you’re saying “Plugins should be able to say ‘don’t disable me! '” And my concern is that would be abused by evil-doers (and also ignorant devs). Which is a higher risk? Temporarily disabling a security plugin or not being able to disable a malicious one? I’d say the higher risk is the outside malicious actor, not the one you’ve already allowed to install a plugin on your site (the risks of which are through the roof, whether they have file access or not). And anyway, a plugin like the one you describe could be disabled easily by most users, at least by the current standards (via. renaming the file). This should be something plugin dev’s have as an option, just like it should be the user’s option to disable it at a sitewide level. I agree with @ircmaxell If a malicious plugin is installed then the recovery mode is the least of your problems. Malicious plugins have access to the filesystem and can easily allow attackers to upload php shell scripts or edit existing files. Thanks for your feedback @ircmaxell . It is worth noting, this feature is not really designed to help with if your site is hacked. Is a get a plugin on your site, in many case they will have access to the database and filesystem and that means nothing can be trusted. This feature is designed to help users with bad plugin / theme code and the move to have 5.2+. 1. By opting into recovery mode, you take that risk on yourself. That is why it is not forced on users. We can improve messaging on the risks on recovery mode. 2. I will open a ticket to up the key length from 20 to 22. 3. There are ways to disable the mode completely and the ability to allow your own way into the mode. My hope is that hosts add options to they admin panel and disable this email link as it is will never be secure as another login. Thanks everyone this sounds incredible. While reviewing the process flow and taking into account my personal and client use cases… I foresee some of the causes that a plugin needs to be paused is due to a failed update leaving it incomplete; manual editing leaving broken code; an update that introduced a conflict; or a plugin/theme that was compromised due to a vulnerability. In all of these cases my first step as a developer is always to replace the corrupt plugin/theme from the one available on the WP repository, and in some cases replace it with a previous version if the latest version introduced a conflict. With that in mind I was wondering if it would make sense to provide the user the ability to re-install plugins/themes that are throwing fatal errors. The ability to pause is great, but often the fix simply involves replacing the compromised plugin. This may fall more into plugin territory but wanted to introduce the idea, if it makes sense as a potential future addition to the workflow let me know and I’d be happy to open a ticket as assist in working on it. Regarding mu-plugins directory side of things, I’ve had some experience with this whilst making the WP Safe Mode plugin which selectively disables specific mu-plugin files. Based on that, I would imagine it’s quite doable to deactivate those as well especially if you are able to add the necessary code to WP Core. The main niggle I’ve come across is on rare occasions an mu-plugins script makes use of the WPMU_PLUGIN_DIR for loading subdirectories which then throws a fatal error, but if the initial loading of MU plugins selectively is handled in core without modifying that constant vs. what I do via a loader, then this becomes a non-issue. Thanks for this great post. I’m going to try and give some UX feedback for you here and then in the correct issues. On the surface, a recovery mode sounds a great idea. I think it has to be done with caution as a powerful feature, but that is a case of design. The message warning perhaps needs working on. If anyone of any level can do this, ensuring they are supported, informed and calm is key. How obvious is being in this mode? It needs to be obvious enough to not ‘set and forget’. I don’t think just a link works in this case, it’s a mode just like an OS recovery mode if I am correct? Thank you for the user flow chart it was incredibly helpful coming to this and trying to give feedback. This looks super great. Thank you for all of your work on this, and for the post! Need to do some testing on the patch itself, but am excited about it. The only caveat I can think of straight away is that mail deliverability isn’t always great from web servers. That doesn’t keep it from being a big improvement from users not being able to have access to sites with fatal errors at all, and it can always be iterated on. There are new drop-ins to allow you to write custom logic for this feature. Honestly I hope that hosting companies turn off emails and work out a better that scales for them.